The objective of the present study was to compare the clinical performance of screw-retained, monolithic, zirconia, and cemented porcelain-fused-to-metal (PFM) implant crowns. In a prospective, randomized, clinical, split-mouth trial, 22 patients’ bilateral premolar or molar single-gap were restored with either screw-retained (test group) or cemented supraconstruction (control group). Clinical parameters, soft-tissue health, crestal bone-level changes, technical complications, and patient’s subjective feelings were recorded during a follow-up period of 12 months. No implant was lost during the follow-up period. Of the crowns, 4.5% (test) and 9.1% (control) showed bleeding on probing (P = 1.000), and plaque was visible in 13.6% (test) and 27.3% (control) of the crowns (P = 0.240). Changes in bone crest level seemed to have no correlation with the restoration method (P = 0.77/0.79). Technical failures were observed in three restorations of the test and four of the control group. 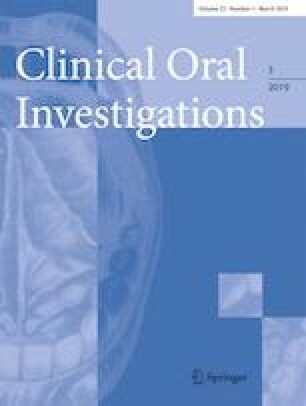 Evaluation of patients’ satisfaction revealed high acceptance regarding fit, esthetics, and chewing effectiveness in both groups. Over a 12-month follow-up, screw-retained and cemented crowns could show comparable clinical and radiological results regarding soft tissue health, marginal bone level, and patient satisfaction. Duration of treatment alone was significantly shorter in screw-retained crowns. Prosthetic retention methods are related with the occurrence of complications, such as peri-implantitis. However, scientific valuable data that proof superiority of a specific retention technique are rare. In single-gap implants, screw retention and cementation seemed to achieved comparable results. The study was performed without funding from external resources. All procedures performed in the present study involving human participants were in accordance with the ethical standards of the Ethical Committee of Tartu University, Estonia (Protocol No. 234/T-5) and with the 1964 Helsinki Declaration and its later amendments or comparable ethical standards.